A nice surprise in this price range is the proximity to the ocean and the views. A fantastic value, in a small, low-key non-touristy complex. A nice surprise in this price range is the proximity to the ocean and the views. The quality in the recently remodeled units is also a big step above comparably priced units in South Maui. Unit 7 is on the ground floor. Ocean view, steps to the private pool, and a reserved parking space just outside the unit. The location of the Park Shore is central, with loads of restaurants, bars, a couple of markets, entertainment, shopping, beaches, skating, surfing and snorkeling all in close proximity. Cove Park along with its surf school are right across the street. A short walk from Kamaole Beach Park in one direction and Kalama Park in the other, a lot of activities are steps form your door. Kalama Park has a skatepark and a free outdoor roller rink right next to the ocean ($5 skate rental.) Kalama Park also has a playground, tennis courts, BBQ grills, volleyball and more. One of the top reasons to come to Cove Park. Cove Park across the street is the de-facto place to learn to surf in Kihei. The most regular small surf break in South Maui means there are surf-schools here virtually every day of the year. Next door they rent surfboards, kayaks and paddle boards. Charley Young Beach is a 5 minute walk. Kamaole One, Two and Three within several blocks of each other. Dozens of the worlds best beaches in Kihei, Wailea and Makena are nearby. 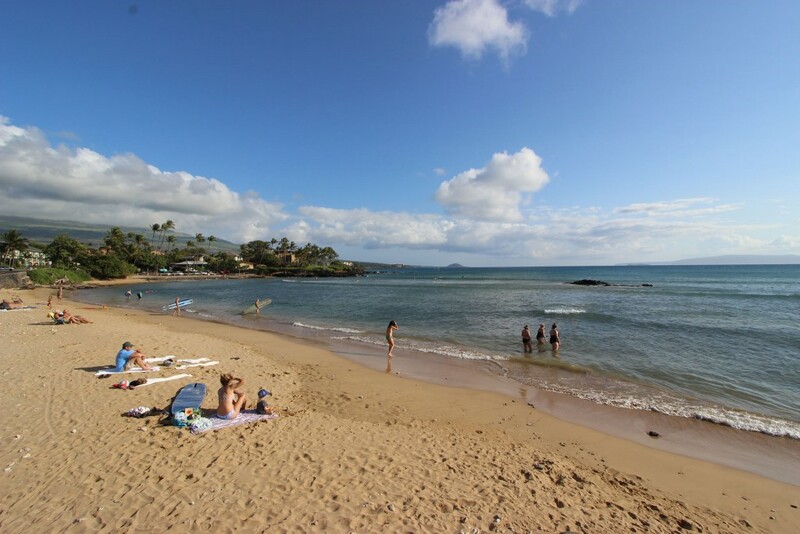 The Kamaoles are the most popular beaches in Kihei for a reason. The closest is the Charlie Young Beach side of Kam I – one of the prettiest spots on all three Kamaoles. You can walk along the shoreline all the way down to Kamaole II & III. All three of these beaches have lifeguards, and are great for swimming, boogie boarding, or just doing nothing but lazing on the soft sand all day! Five world-class golf courses within minutes to choose from. The 16-unit building was constructed as a residential apartment building, and many units are still resident occupied. Each unit is unique & privately owned and the entire complex is non-smoking.